This email is sent only to subscribers.� To subscribe or unsubscribe, email info@PathologyOutlines.com, indicating subscribe or unsubscribe to Case of the Week.� We do not sell, share or use your email address for any other purpose.� We also have emails for Pathologist jobs (biweekly), Other Laboratory jobs (biweekly), website news (monthly), new books (monthly), and a newsletter (twice a year).� You must subscribe or unsubscribe separately to these email lists. Visit our new Heart Tumor chapter, one of 65 chapters in our free, online textbook.� The above tumor often causes sudden death, but may be missed at autopsy unless one dissects the conduction system and takes a section for histology.� Click here for more information on this tumor. 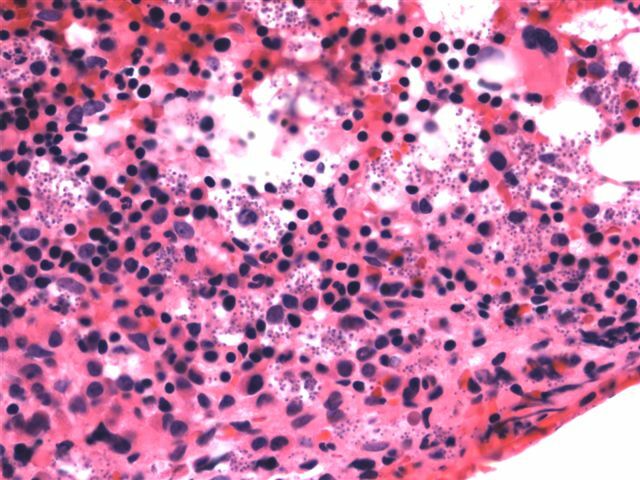 We are finishing our update of the Esophagus chapter, and need gross or micro pictures of: embryologic esophagus, achalasia, chemical/corrosive esophagitis, HIV esophagitis and Crohn�s disease of the esophagus.� Send your images to Dr. Pernick at info@pathologyoutlines.com or call at 248/646-0325. 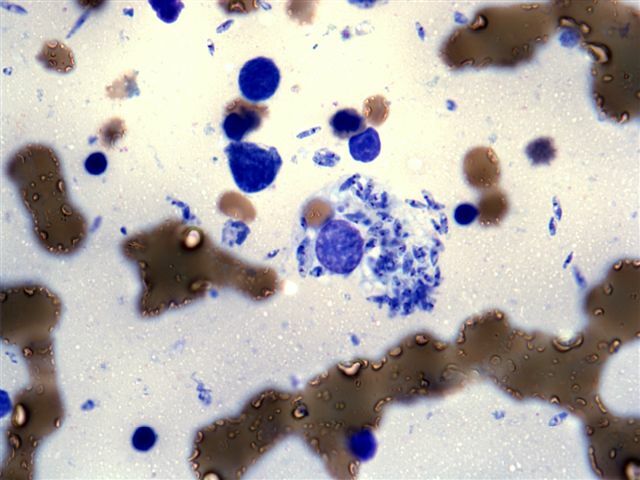 We thank Dr. Anna Wong, Cedars-Sinai Medical Center, Los Angeles, California ( USA).� To contribute a Case of the Week, email info@PathologyOutlines.com with a clinical history, your diagnosis, microscopic images (any size, we will shrink if necessary) in JPG or TIFF format, and any other images (gross, immunostains, etc.) that may be helpful or interesting.� We will write the discussion (unless you want to), list you as the contributor, and send you a check for $35 (US dollars) for your time after we send out the case.� Please only send cases with a definitive diagnosis. 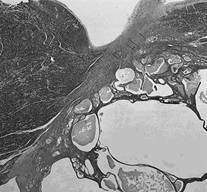 A 41 year old HIV+ man from Central America presented with pancytopenia and skin nodules.� A bone marrow biopsy was performed. Visceral leishmaniasis is caused by the protozoan parasite Leishmania donovani and transmitted by the bite of the infected sandfly Phlebotomus argentipes (life cycle).� It primarily affects HIV+ / immunocompromised patients, and immunocompetent patients in endemic areas (South America, India, Northeast Africa, Mediterranean basin).� It is a parasitosis of the mononuclear phagocytic system, and causes fever, hepatosplenomegaly, hypergammaglobulinemia and pancytopenia. Definitive diagnosis is made by PCR (J Clin Microbiol 2006;44:2343), or antibody / antigen testing.� Smears or H&E sections are often suggestive, as in this case.� The bone marrow is hypercellular with erythroid hyperplasia and often dysplastic changes in normoblasts.� Smears show amastigotes (the form that exists in humans) within macrophages and occasionally granulocytes.� The amastigotes have a distinct kinetoplast (image), which represents mitochondrial DNA (see images).� The differential diagnosis of parasites within macrophages includes histoplasmosis (see images) and toxoplasmosis (see images).� The current recommended treatment is sodium stibogluconate administration.